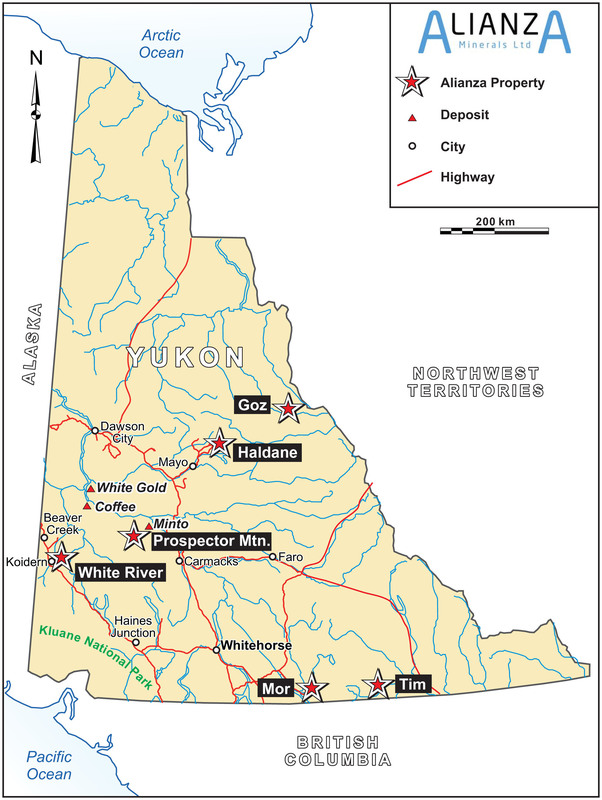 The Goz Creek property consists of 90 mineral claims located 180 km northeast of Mayo, Yukon and is located within the traditional territory of the First Nation of Na-Cho Nyak Dun (“FNNND’). The property covers an area of Lower Cambrian carbonate rocks that host Mississippi Valley Type (MVT) mineralization. The exploration potential to expand the known mineralization is considered favourable. The Corporation does not consider the historical estimates as current mineral resources. A qualified person has not done sufficient work to classify the historical estimate as current mineral resources. The historical estimate should, therefore, not be relied upon. Diamond drilling has returned significant intercepts from Alianza’s’ wholly-owned Goz Creek property in Yukon including 27.91 metres grading 17.19% zinc and 39.67 grams silver per tonne and 27.50 metres grading 12.83% zinc and 10.91 grams silver per tonne. 25.31 metres grading 7.00% zinc, including 2.96 metres grading 20.21% zinc and 17.35 grams silver per tonne. Gallium and germanium response is subdued for most of the samples analysed, however, the highest grade zinc intervals are generally weakly to moderately elevated. The best grades were obtained from hole GZ-08-58 which yielded a weighted average of 118.33 grams germanium per tonne and 19.06 grams gallium per tonne across 3.51 metres. The 7 hole, 772 metre diamond drill program tested down-dip and along strike from the known and historic resource at the Main Zone, which is 2,893,000 tons grading 11.25% zinc and containing 650,000,000 pounds of zinc metal. The historic resource is non-compliant with National Instrument 43-101, however it is considered material to the prospectivity of the Goz Creek project. A qualified person has not done sufficient work to qualify the historical estimate as current mineral resources and it should therefore not be relied upon. Table I summarizes the significant intersections encountered from the 2008 diamond drill program. True thicknesses of all intersections are unknown at this time.